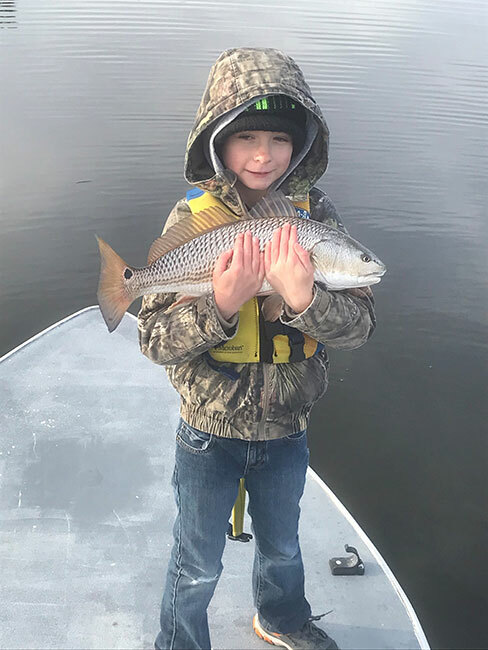 Emerson proudly shows off a winter redfish landed by his dad, Chris. My iPhone weather app said it was 30 degrees when I left the house. 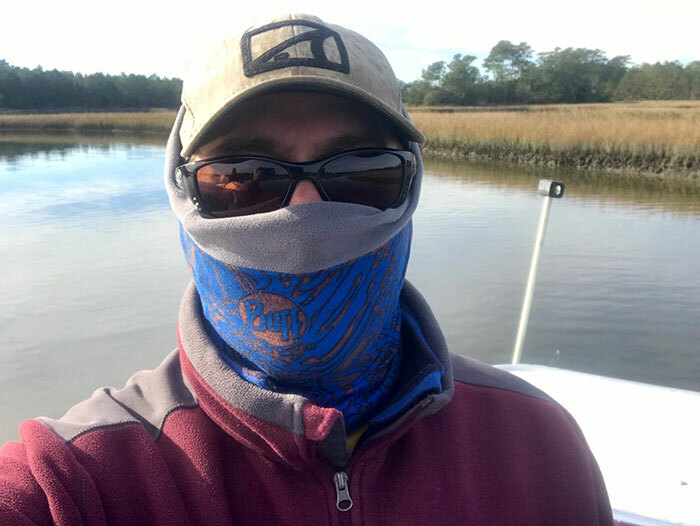 I was meeting Chris Ellis and his seven-year-old son, Emerson, in an out-of-the-way North Carolina town near an out-of-the-way boat ramp on an even farther near an out-of-the-way creek. It was four days after Christmas, and the weather had been pretty bad for the previous couple days. On this day, the wind was supposed to let up and the sun was supposed to show. Perfect. It’s hardly 20 below, but you’ve gotta dress for the cold on the winter flats. We put the boat in and slowly cruised upstream through the narrow creek with the spartina grass tops above our heads. With the dropping tide, I was expecting the fish I knew to be in this creek to concentrate in some of the deeper spots. It was still a few hours until low tide, and the water was still covering the flats to about 8 inches deep. 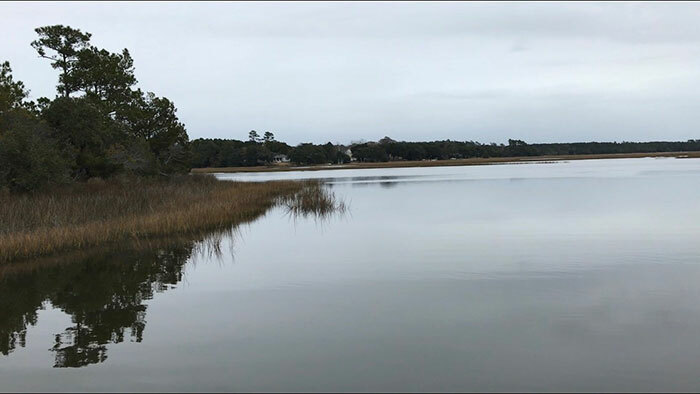 I started poling across the first spot, a slightly deeper depression next to an oyster bar, and I could see some movement: slight waves made by redfish feeding in the clear shallows. I had Emerson casting a soft plastic shrimp imitation, and Chris had his 8-weight Recon. There was a slight splash, and I saw the tip of a tail come clear, then another. Emerson made a great cast and immediately had a fish on. It was a beautiful 26-inch redfish, and he was psyched because he did it all by himself! Emerson was proud to have landed this beauty all by himself. Next was Chris’s turn, and he put his size 2 pink and chartreuse Craft Fur Minnow right in the spot and was soon hooked up. 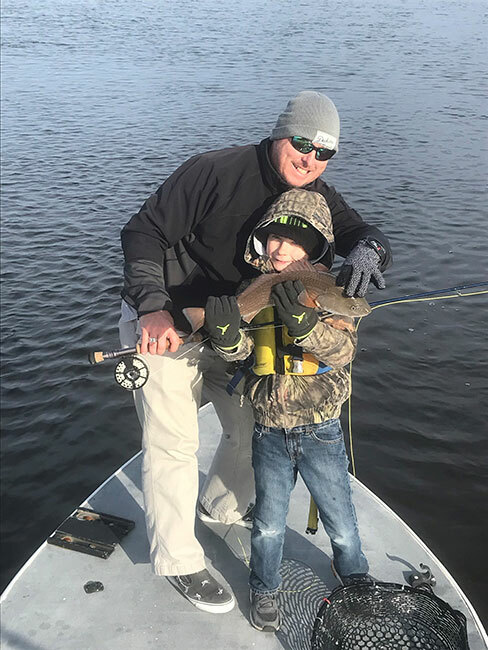 Here we were—on a cold, clear Carolina morning, a few days after Christmas, out for less than 30 minutes—and we already had caught two redfish. It went on like this the rest of the morning. 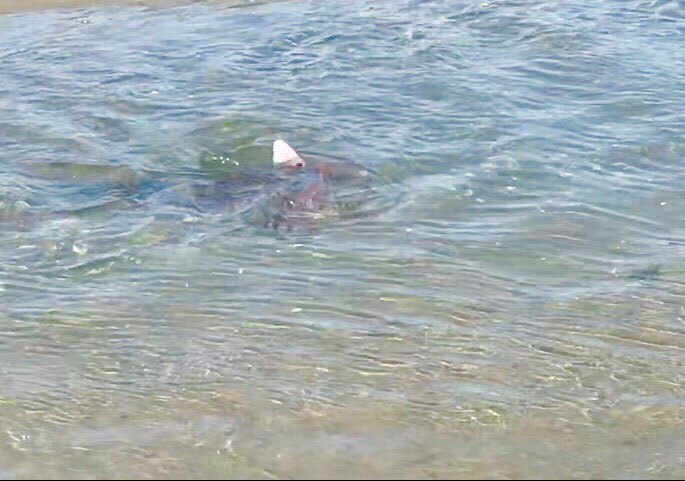 When the tide got really low, I put my waders on,found a hard-sand channel, and followed some fish around. I got pretty close a couple times, but those fish didn’t want to cooperate. Finding the fish is the first order of business. Look for swirling wakes. Winter reds tend to school up in pretty nice-size groups. You won’t find any fish until you find all the fish. There will be lots of water with nothing in it, but then when you find the right spot, it will seem like they are all there. Look for deeper holes attached to flats, near channels with access to larger areas. One thing these fish will not want to do is to go into any places with dolphins. Redfish are dolphin chow in winter, so don’t waste a lot of time fishing spots in the Intra-Coastal Waterway. The dolphins will sometimes even gather off the mouths of creeks where they know redfish are sheltering. When the tide gets all the way out, the reds will find the only deep water available, and those holes will sometimes have hundreds of fish. Find one fish, and you have probably found a lot more. I use a 6-weight much of the time. Many of the fish will be right around 20 inches, and a 26-incher gives a nice account of itself. If the wind comes up, an 8-weight may be better, especially if you use a weighted fly. With the preponderance of small minnows in the creeks during winter, small baitfish imitations work better than fancy shrimp or crab flies. A couple Clousers in varying colors (tan over white, pink over green, all white) work great when the fish are in channels or flats deeper than 12 inches deep. 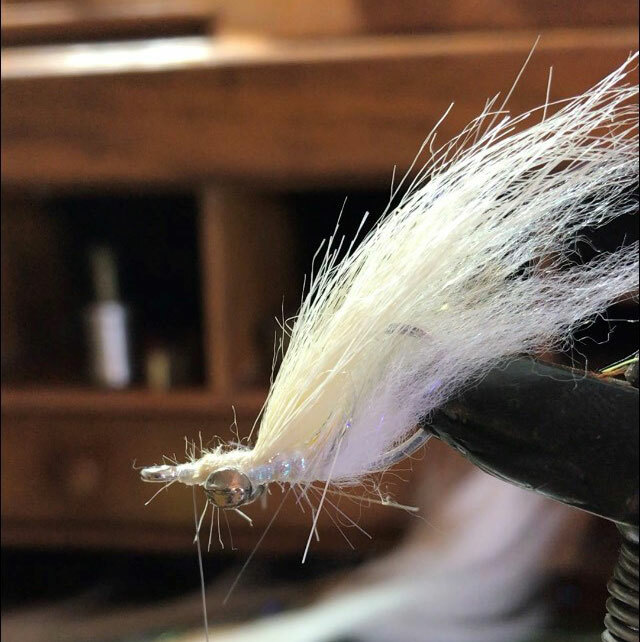 In shallower areas, I like something that will suspend or hover just under the surface; flies tied with bucktail will do the job. Simple baitfish patterns, such as Clouser Minnows, usually work well in winter. I was on the bow when we came around the corner on a flat, looked around the spartina grass, and saw wakes moving across the flat. I knew that if we got too close, the fish might spook. I pulled 80 feet of line off my reel and laid it out so my fly landed 6 feet in front of the lead fish. As soon as I moved the bucktail Deceiver, the lead fish sped up and gobbled it down. There are loads of patterns that will work on these fish. No need to get too fancy. Small baitfish, either weighted or not; depending on the depth. That’s it. The author got in on the game, as well, with this fine redfish. Pick a day with a temperature that you feel comfortable with. Hope that the wind lays down a little bit, so you can see the wakes as the fish feed. Maybe a little sunshine, too. Find a good creek with some fish in the right spots. 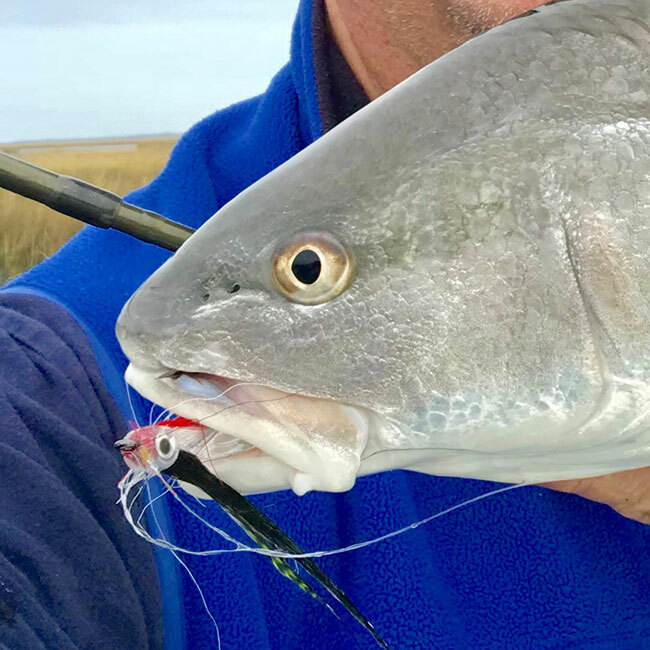 It’s possible you could have a great day with winter redfish and maybe even forget that it’s winter. The toughest thing is finding them in the first place. But no matter what happens, it sure beats ice fishing. Great article on what to look for when your on the hunt. Especially someone like me who loves to fish everywhere I go. If I am from out of state where would I go to get a license to fish in NC. Do they have a short term (5 day) or would I need to pay for the whole year? What’s a NC fishing license cost? Could I get it online before I even leave home? Not sure about online but lots of bait shops, or even Walmart. Short term for $15 I think…don’t need full year, anyway.